CloudFormation support was introduced to Octopus 2018.2. 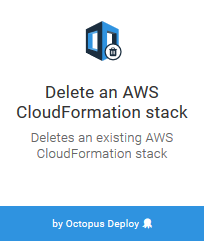 Octopus supports the deletion of an existing AWS CloudFormation stack through the Delete an AWS CloudFormation stack step. This step deletes a CloudFormation stack using AWS credentials managed by Octopus. The proceeding instructions can be followed to configure the Delete an AWS CloudFormation stack step. Add the Delete an AWS CloudFormation stack step to the project, and provide it a name. Select the variable that references the Amazon Web Services Account under the AWS Account section or choose to execute using a service role assigned to the EC2 instance. If you don't have an AWS Account Variable yet, check our documentation on how to create one. Under the CloudFormation section, the AWS region and stack name need to be defined. If the stack does not exist, this step will succeed and not attempt to delete it again. You can also optionally wait for the stack to be deleted completely before finishing the step by selecting the Wait for completion checkbox. Unselecting the Wait for completion checkbox will allow the step to complete once that CloudFormation deletion has been initiated. However unselecting the option means that the step will not fail if the CloudFormation stack deletion fails.